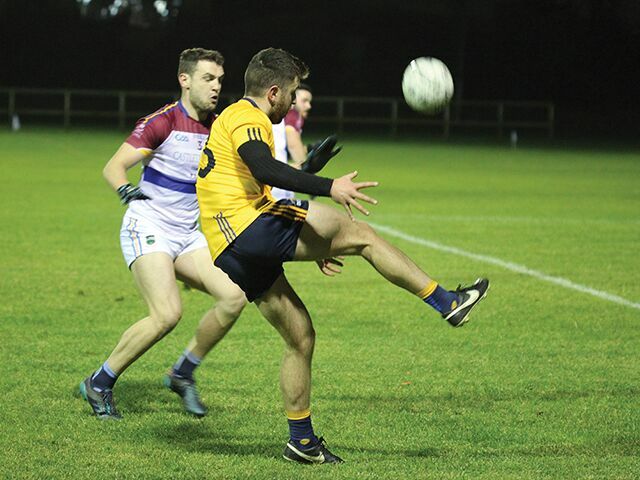 The DCU senior footballer’s Ryan Cup hopes came to an end as they suffered a five-point loss to University of Limerick in St Clare’s last Thursday. UL led from start to finish with their physical and pacey attack causing serious difficulties for the DCU defence in the first half. The UL full forward line ran through easily in the opening minutes to take the lead at two points to no score. The DCU attack found UL hard to break down with DCU forward Stephen Smith getting an early yellow card after a rash challenge on the one of UL’s midfield. Austin Stack dynamo David Mannix steadied the ship for DCU as he pointed two excellent frees to have the sides all square at two apiece. That was the last time DCU would catch UL as a bad turnover on the way out of defence was punished emphatically by UL. Dessie Reynolds fouled the UL corner forward in the area and UL converted the penalty putting them in the driving seat. UL added another point soon after as the DCU defence struggled to retain discipline when tackling the UL runners coming through. DCU hit back after a turnover in midfield was capitalised on as Dessie Reynolds completed a well worked counter attacking move to get DCU’s only score from play in the first half. Although the DCU defence began to tighten up, any conceded frees inside the 45 were punished by the UL place kickers. One from near the 21 along the side-line. Mannix pointed a massive free from his hands from well outside the 45 to make the score at half-time DCU 0-4 to UL 1-6. DCU looked a much hungrier team in the second half as the ball was thrown in after half-time. The first play then resulted in a UL player and DCU centre back Barry Kerr getting yellow cards after the two were pulling and dragging each other’s jerseys. UL kicked off the scoring in the second half like in the first with yet another pointed free after indiscipline in DCU’s defensive structure. UL were very patient on the ball and even had a second half substitute come off the shoulder and run towards the “D”, pointing an inspirational point to stretch their lead to seven points. 0-4 to 1-8. DCU struggled initially to swing a comprehensive attack as the UL sweeper mopped up every ball that was kicked in. Then DCU, propelled by the half backline and midfield, started to kick in their running game and began to punch holes in a solid UL defence. After a series of hand passes DCU’s Declan Monaghan palmed the ball to the incoming Conor Hickey who cut inside and curled the ball over from a tight angle. DCU through Thomas Galigan and Stephen O’Brien really began to take control of the aerial battle at midfield and from this platform Dessie Reynolds received the ball and kicked a brilliant point on the run to narrow reign UL back to five points. DCU could have been dead and buried moments later as UL bore in on goal. Keeper Conor Forde denied the UL attack with a brilliant goal line save from close range. He blocked the ball on his knees and cleared the line. Unfortunately, DCU couldn’t build on the seismic save as the UL forwards engulfed DCU coming out of defence before a snapshot saw the ball float over from 40 yards out. DCU’s evening went from bad to worse as centre back Barry Kerr picked up a second yellow for an extremely high neck tackle on a UL player. DCU now down to 14 men struggled to get possession back off a composed UL side. Thomas Galigan was the man who really stood up for DCU to try and claw their way back into the match just as all hope looked lost. He won a high ball in just outside the “D” and turned to kick a brilliant aggressive point high and over the bar. UL then added two well worked long ranged frees to their tally to extend their lead to seven points. But DCU showed their potential near the end with a moment of magic from Thomas Galligan highlighting that they will always be a serious threat come Sigerson. Galigan jinked around three UL players before rocketing the ball to the top left-hand corner of the net while going full pace from 20 yards out. But his efforts were too late and a late free from UL hand saw them through to the Ryan Cup semis with a deserved five-point victory over DCU. “We were beaten by a better team today, physically bigger and well managed”, said DCU manager Niall Moyna. “We were missing quite a few of our senior team, but it was a great opportunity for us to let some of the new lads see the level they need to be at for Sigerson,” said Moyna. Moyna said that the long break will allow the team to take a step back and refocus their efforts on the Sigerson. DCU: Conor Forde, Conor Morrison, Fintan Kelly, David Neary, Shairoze Akram, Barry Kerr, Declan Monaghan, Thomas Galligan, Stephen O’Brien, Dessie Smith, Eoin Smith, Tom Lahiffe, Michael Plunkett, Stephen Smith.